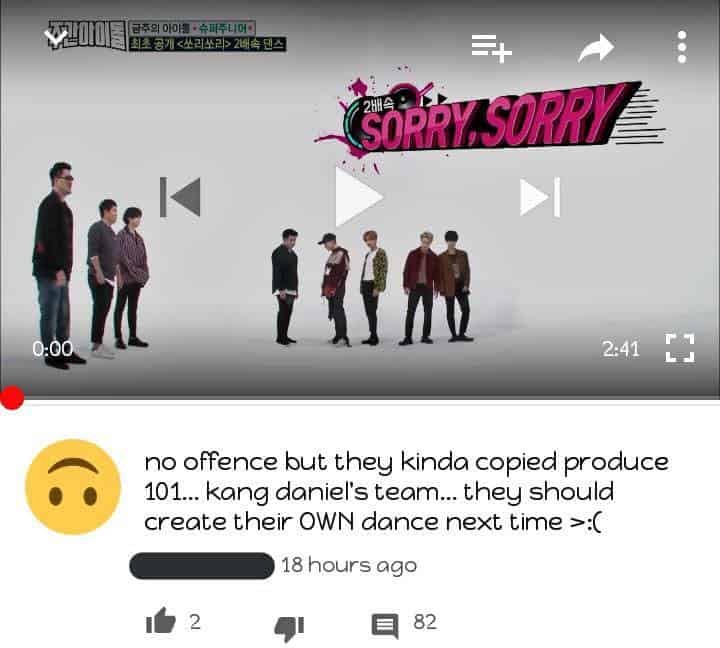 It is still unknown whether this was a crazy fan of Kang Daniel or an anti-fan of Suju, but obviously, he made the Kpop netizens surprised when he insisted on…asking for the justice of team “Sorry Sorry” in Produce 101. If you have known Kpop for a long time, you must know that “Sorry Sorry” of Super Junior was one of the top lendary hit in Kpop history. It used to be an unexpectedly hot song around the world. Until now, “Sorry Sorry” is still talked about as a signature representative of Hallyu and covered by a lot of “hoobae”. However, unfortunately, it seems that not every Kpop fan knows this. Recently, on the occasion of their comeback with the new album “PLAY” fronted by the song “Black Suit”, Super Junior participated in “Weekly Idol” and did not hesitate to experience the double speed challenge. In this challenge, Super Junior participated with 2 songs which were “Sorry Sorry” and “Black Suit”. However, it was unexpected that this challenge led to a situation where the audience did not know whether to laugh or cry. Many people found this opinion annoying but funny at the same time because there’s no rule showing that the longer version is the original one. Moreover, this is a double speed video, so obviously, the song will be shorten. Nevertheless, this is completely a situation which was “understood by everyone except for one”! Hundreds of replies were left for this comment, including soft explanation as well as strict criticism. However, that guy still insisted on his opinion that Super Junior was only singing…a demo version. He even took EXO and Red Velvet as examples for his thoughts. After 3 days keeping silent, it was thought that he would give up and delete his comment. However, recently, he continued to leave another comment to ask for team Kang Daniel’s justice. He even stated that he would send an email to Youtube to request them quoting the source was from Kang Daniel. Moreover, from the Twitter account provided by the authentic user, Super Junior’s fandom also recognized that, the owner of the above shocking statement even spread a very ridiculous piece of news that “Suju copied Kang Daniel” on some site and forums. Of course, he did not forget to ask for justice for Kang Daniel and the team “Sorry Sorry” in Produce 101 season 2. This story was widely spread by both national and international ELF community. Some fans even provided the guy with some information about “Sorry Sorry” since 2009, but this Youtube user seemed to ignore everything. We do not know whether this was a big fan of Kang Daniel or simply an anti-fan of Super Junior, but obviously, that statement totally surprised ELF community as well as many Kpop fans. They found it annoyed and funny at the same time. Many thought that this was just an action to promote his Twitter account. If that’s the truth, this person probably already reached his goal. Frantic rumors of 2 idols in Jung Joon Young’s sexual group chat: Are they members of Super Junior and 2AM?